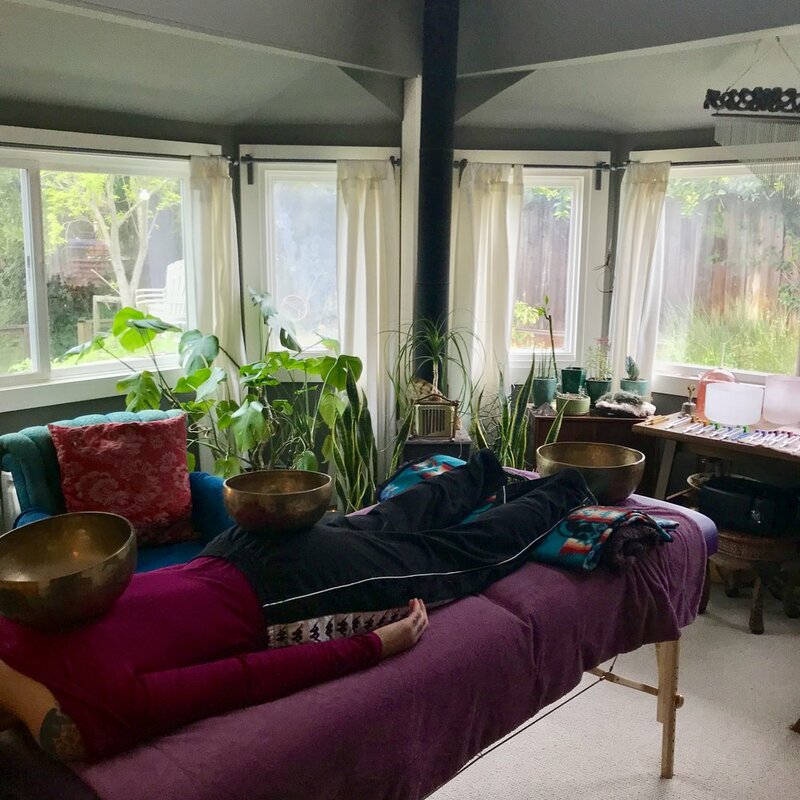 Sandra Kathleen Bowling, MA, LMFT, offers support counseling, psychoeducation, sound healing aka vibrational body work, and sound bath meditations in Berkeley CA. Sandra also works remotely providing mental health first aid, education, counseling and sound meditations within communities gathered for summer camps, education, healing, ritual, and celebration. Please contact for consultation and booking. Vibrational Body Work is an offering designed to support stress reduction and relaxation while clearing stagnant energy, increasing the sense of clarity, vitality, and ease in your body. This body work integrates therapeutic sound tools including Acutonics tuning forks, metal singing bowls, crystal singing bowls, chimes, and bells, along with hands on massage. The crystal singing bowls Sandra works with are made of rose quartz, selenite, and pink himalayan salt. Body work happens on a massage table with clothing on. This treatment is excellent for anyone suffering with emotional burnout, compassion fatigue, overwhelm, anxiety, or seeking spiritual clarity. Sandra offers holistic relationship coaching for individuals. In this context relationship refers to relationship with self as well as environment, and others. Coaching includes a combination of support counseling, and skill building. With these two focuses you can process experience, increase self awareness, your ability to self regulate, and increase relationship satisfaction. This offering is a 90 minute combination of the above offerings. We meet and discuss whats happening in your life. I provide counseling and education to support you gaining insight and new skills to practice with yourself and in relationships. We then transfer you to the table so that you can receive the bodywork to support relaxation and the healing intention you hold.